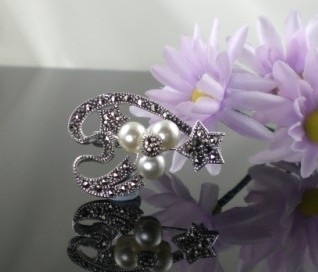 Marcasite silver and pearl brooch, featuring striking inset marcasite stones and beautifully set pearls.Pearls are considered to offer the power of love, money, protection, and luck. Pearls are thought to give wisdom through experience, to quicken the laws of karma and to cement engagements and love relationships. They are thought to keep children safe.Early Chinese myths told of pearls falling from the sky when dragons fought. 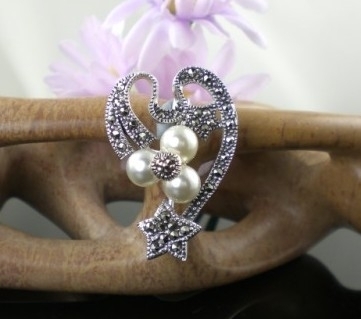 Ancient legend says that pearls were thought to be the tears of the gods and the Greeks believed that wearing pearls would promote marital bliss and prevent newlywed women from crying. MaterialSilver& MarcasiteGemstonePearlDimensions30 x 22mmThe marcasite features first class "diamond" cut facets ; exceptionally generous amount of hallmarked 925 silver used - making this a very strong piece. 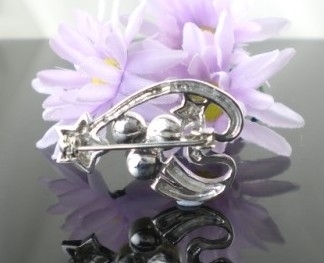 A really beautiful piece of marcasite jewellery. Admired by everyone who has seen it! !My marcasite jewellery comes in a handmade Mulberry Paper envelope as opposed to a box.If you require your item(s) to be boxed please let us know and add £1.25 to your purchase.P&P is £2.50 for the UK and £4.50 for Rest of the World.Please note that postage is per order - so multiple item purchases only pay 1 P&P charge.